I hate knitting colourwork mitten thumbs. They’re just so fiddly and little. Bleh. Bleh, indeed, and I’ve never even done colorwork mittens. I hate knitting mitten or even fingerless mitt thumbs, period. I completely understand, and agree. But it’s worth it! I totally agree. I avoid knitting gloves because I don’t want to have to deal with knitting five of the suckers. One is bad enough. I agree. But do you like your Knit Picks needles? I was thinking of ordering some. I *love* knitting thumbs. Although I haven’t yet knit colorwork thumbs. I love knitting fiddly little things. You can do it Laura! Looking forward to the photo shoot to see how it all turns out. How wrong would it be to do a plain thumb on a colorwork mitten? I am with Christy- well, I love knitting colorwork thumbs. Not so much full fingers on gloves. 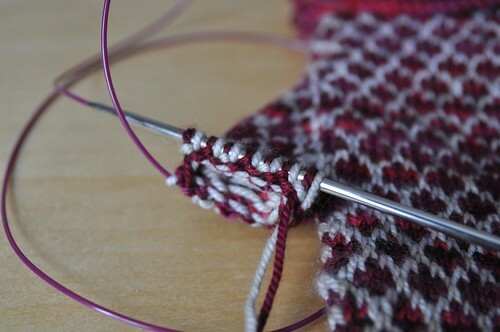 Thumbs can be such a fun place for an unexpected detail- a motif hidden on the inside of a mitten thumb, or even just how the thumb patterning perfectly lines up with (or compliments) the pattern. I often just work the thumb stitches with 2 dpns to hold the stitches- I don’t get holes on such a small surface, and magic loop just involves tangles with so few sts. looks like you are doing a fine job to me. They sure are pretty mittens though! I’m also about halfway through your beauchamp cowl and I absolutely LOVE it! The main color is black (silk angora blend) and the cc yarn is leftover sock yarn……very lovely! Thanks for the pattern! I’m just about to start colorwork mittens… Wish me good luck! They are going to be (I hope) so pretty! I hate them too! Ick. And the fact that it’s just as bad whether you use magic loop or dpns just isn’t fair! Hey Laura- Love those mittens. Still hoping that you’ll write the pattern up for purchase in the near future! Those colours together are awesome. I haven’t actually knit any mittens yet (I have yarn for a pair that will see the light of day as soon as I get my shawl finished), so I don’t know if I will find the thumb overly fiddly. I need the extra warmth that colorwork can provide, so I’m hoping to make short work of my current project! Whoa, that is really small. Pretty colors though :) Hang in there! I agree that thumbs aren’t fun (or the fingers in gloves! Have you tried with dpns? I know it’s a highly individual choice, but I do find that really small diameter knitting is a little easier to bear with dpns. Although, it was Meg Swanson’s distaste for knitting fingers on dpns that led her to develop her I-cord finger technique. I guess there’s no good solution!